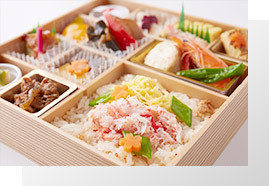 WJS Ginza guests can enjoy the attractiveness of Japanese culture on all levels including dining. 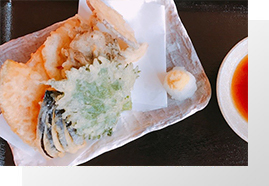 We serve the best Japanese food such as soba, tempura, sushi, unagi and kaiseki cuisine. 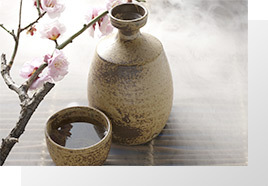 in a relaxed atmosphere of Japanese tatami rooms or indoor Japanese garden. 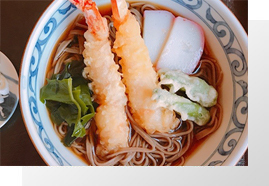 In WJS Ginza store you can order various types of soba, traditional Japanese noodles. Enjoy your lunch with your coworkers, friends or family in the comfort of a sumptuous Japanese atmosphere. Enjoy our vegetarian menu in the comfort of a sumptuous Japanese atmosphere. Japan can be felt through meals and drinks. Please enjoy them in the comfort of a Japanese garden.